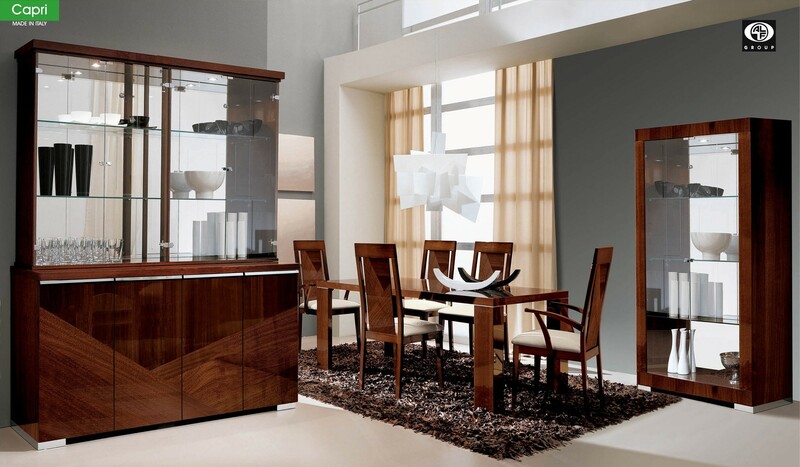 Whether your dining room is styled in a contemporary, modern or classic décor Capri collection will fit right in. 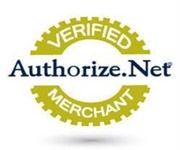 It shows high quality, rich look and finest craftsmanship every time you touch or look at it. 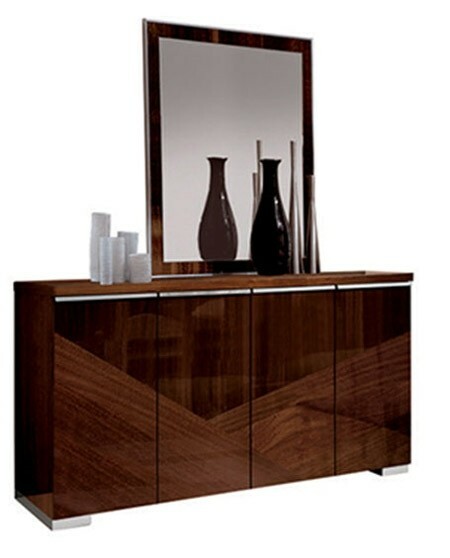 Unique two-tone brown lacquer finish it is a great investment which will serve in your home for years to come. Made in Italy by ALF Group imported by ESF. 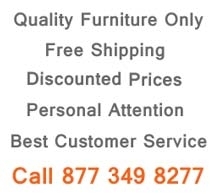 Table: W81" - 117" x D42" x H31"
Chair: W21" x D24" x H43"
Armchair: W24" x D24" x H43"
4 Door China Cabinet: W67" x D22" x H86"
4 Door Buffet: W67" x D22" x H37"
Buffet Mirror: W45" x D2" x H42"
2 Door Curio: W39" x D20" x H72"
Large table is a must for a spacious room and Capri offers table with 2 leaf overall thirty six inch extension that conveniently hides under the table. This piece can be as long as one hundred and seventeen inches so you can relax in comfort and luxury. Bold squared legs are accented with metallic pieces at the top that add more style. Brown lacquer is used for a finish. These chairs are very comfortable and also offer neutral classic contemporary design that match perfectly to the rest of the set. Seats are cushioned and upholstered in cream leather while high backs and legs come in a same wood with brown lacquer finish. Available with and without the arms rests. 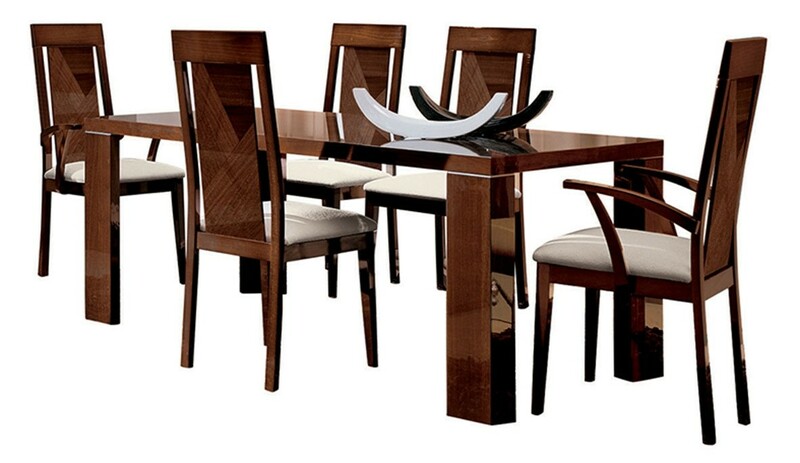 If you'd like to expand your dining room set you can choose other items from this collection. 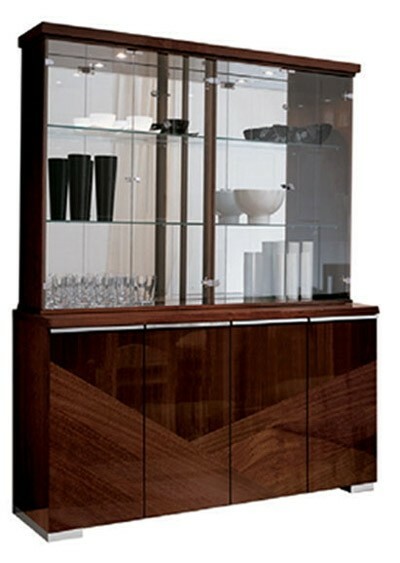 China cabinet has lighting under a large glass display and spacious four door cabinet with stainless steel hardware and legs. 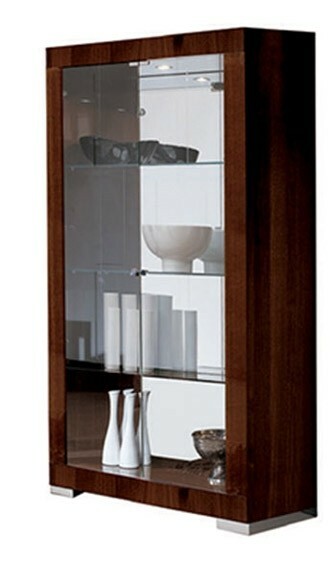 Two-door curio also features brown lacquer finish and a large glass display area with lighting inside.